Once extending more than 1 million square kilometers across the plains of the Indus River from the Arabian Sea to the Ganges, over what is now Pakistan, northwest India and eastern Afghanistan, the Indus civilization was the largest—but least known—of the first great urban cultures that also included Egypt and Mesopotamia. Like their contemporaries, the Harappans, named for one of their largest cities, lived next to rivers owing their livelihoods to the fertility of annually watered lands. Today, numerous remains of the Harappan settlements are located in a vast desert region far from any flowing river. In contrast to Egypt and Mesopotamia, which have long been part of the Western classical canon, this amazingly complex culture in South Asia with a population that at its peak may have reached 10 percent of the world’s inhabitants, was completely forgotten until 1920’s. 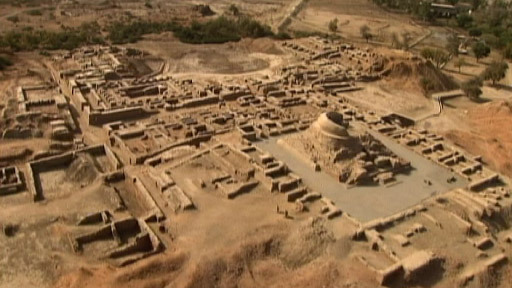 Since then, a flurry of archaeological research in Pakistan and India has uncovered a sophisticated urban culture with myriad internal trade routes and well-established sea links with Mesopotamia, standards for building construction, sanitation systems, arts and crafts, and a yet-to-be deciphered writing system. “We considered that it is high time for a team of interdisciplinary scientists to contribute to the debate about the enigmatic fate of these people,” added Giosan. The research was conducted between 2003 and 2008 in Pakistan, from the coast of the Arabian Sea into the fertile irrigated valleys of Punjab and the northern Thar Desert. The international team included scientists from the U.S., U.K., Pakistan, India, and Romania with specialties in geology, geomorphology, archaeology, and mathematics. By combining satellite photos and topographic data collected by the Shuttle Radar Topography Mission (SRTM), the researchers prepared and analyzed digital maps of landforms constructed by the Indus and neighboring rivers, which were then probed in the field by drilling, coring, and even manually-dug trenches. Collected samples were used to determine the sediments’ origins, whether brought in and shaped by rivers or wind, and their age, in order to develop a chronology of landscape changes. From the new research, a compelling picture of 10,000 years of changing landscapes emerges. Before the plain was massively settled, the wild and forceful Indus and its tributaries flowing from the Himalaya cut valleys into their own deposits and left high “interfluvial” stretches of land between them. In the east, reliable monsoon rains sustained perennial rivers that crisscrossed the desert leaving behind their sedimentary deposits across a broad region. Among the most striking features the researchers identified is a mounded plain, 10 to 20 meters high, over 100 kilometers wide, and running almost 1000 kilometers along the Indus, they call the “Indus mega-ridge,” built by the river as it purged itself of sediment along its lower course. In another major finding, the researchers believe they have settled a long controversy about the fate of a mythical river, the Sarasvati. The Vedas, ancient Indian scriptures composed in Sanskrit over 3000 years ago, describe the region west of the Ganges as “the land of seven rivers.” Easily recognizable are the Indus and its current tributaries, but the Sarasvati, portrayed as “surpassing in majesty and might all other waters” and “pure in her course from mountains to the ocean,” was lost. Based on scriptural descriptions, it was believed that the Sarasvati was fed by perennial glaciers in the Himalayas. Today, the Ghaggar, an intermittent river that flows only during strong monsoons and dissipates into the desert along the dried course of Hakra valley, is thought to best approximate the location of the mythic Sarasvati, but its Himalayan origin and whether it was active during Vedic times remain controversial. Archaeological evidence supports the Ghaggar-Hakra as the location of intensive settlement during Harappan times. The geological evidence—sediments, topography— shows that rivers were indeed sizable and highly active in this region, but most likely due to strong monsoons. There is no evidence of wide incised valleys like along the Indus and its tributaries and there is no cut-through, incised connections to either of the two nearby Himalayan-fed rivers of Sutlej and Yamuna. The new research argues that these crucial differences prove that the Sarasvati (Ghaggar-Hakra) was not Himalayan-fed, but a perennial monsoon-supported watercourse, and that aridification reduced it to short seasonal flows. Such a system was not favorable for the Indus civilization, which had been built on bumper crop surpluses along the Indus and the Ghaggar-Hakra rivers in the earlier wetter era. This dispersal of population meant that there was no longer a concentration of workforce to support urbanism. “Thus cities collapsed, but smaller agricultural communities were sustainable and flourished. Many of the urban arts, such as writing, faded away, but agriculture continued and actually diversified,” said Fuller. ← Apocalypse Soon: Has Civilization Passed the Environmental Point of No Return?